New Zealand’s only Great Walk that is not a hike can be done as a 5-day (145km) or 3-day (87km) trip. We chose the shorter version from Whakahoro to Pipiriki. We made two prior attempts at this trip – in 2014 and Easter weekend 2017 – which were cancelled do to unsafe water levels. This time we were lucky and the rain started after we were underway. We left Auckland at 7:30pm on Thursday and arrived in Taumaranui after 11pm. Taumaranui Canoe Hires allows customers to freedom camp on their property, but since we were arriving after dark we booked a private room with a hot shower. Upon arrival we received a brief tutorial on how to load and seal the waterproof kegs. We packed them and got some shuteye before an early start the next morning. At 7:15am we filled in the required paperwork and received a thorough safety briefing. Before long we loaded into the van for the 60+ minute drive to Whakaporo. Day 1: 10:30am-5pm on the river. Started at Whakahoro, lunch at Mangapapa, finished at John Coull Hut just before steady rain set in. 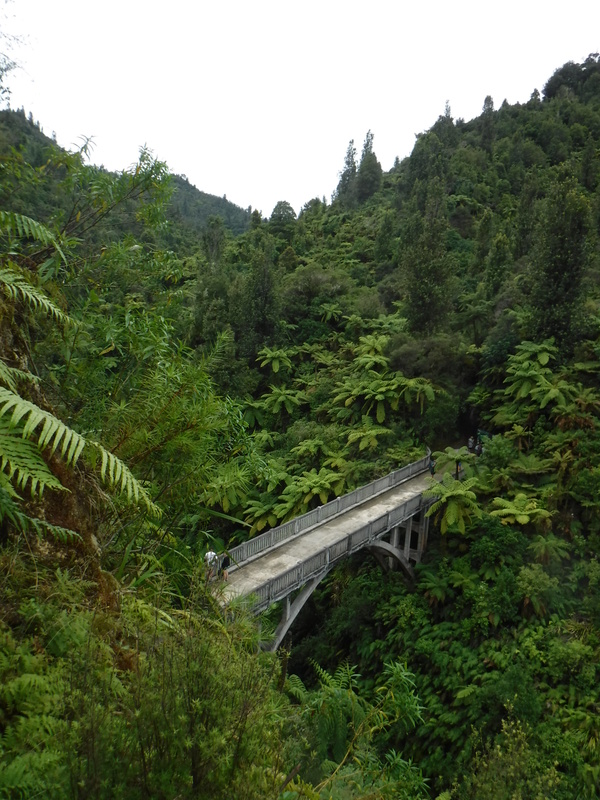 37.5km through the Whanganui gorge. Day 2: 8:30am-4pm on the river. Rest stop at Mangawaihi, lunch and 5.4km Bridge to Nowhere walk at Mangapurua, finished at Tieke Kainga. 29km. Tieke Kainga Hut is the only DOC hut that is also used as a marae. Across the river from Tieke is a private campsite and lodge (with showers) and a pub where paddlers can get a beer. It was too wet for us to check it out. Day 3: 8:15am-12:30pm on the river. Rest stop at Ngaporo. 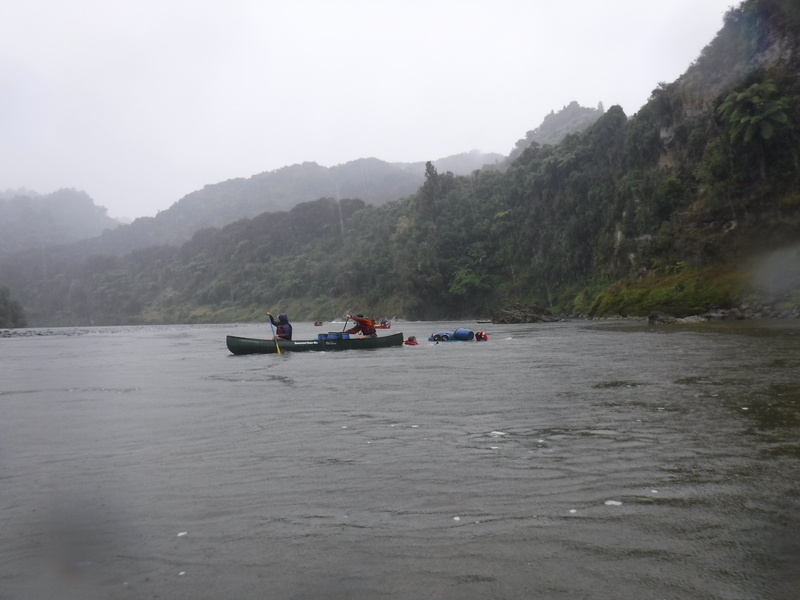 21.5km through the gorge of the Manganui o te Ao River and over the two biggest rapids on the river – Ngāporo and Autapu. We did not capsize on the 50-50 rapid, but the couple behind us did. True to its namesake that half of those who ride it will fall out. Food & Drink: We brought food for the journey from home. The DOC huts had gas stovetops.